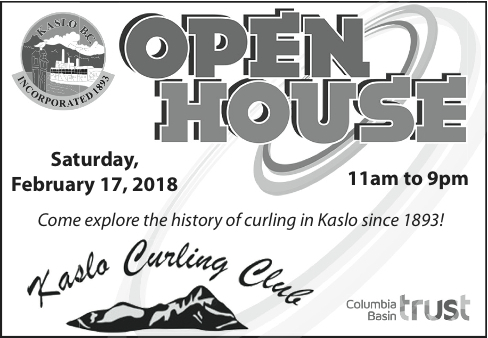 Come up to the Kaslo Curling Club on Saturday, Feb. 17 to explore the history of the oldest curling club in BC, founded in 1895. The club will be open from 11 am to 9 pm, although we ask that you please avoid 6 – 7 pm when the Kaslo 125 Funspiel participants are having dinner. Do you have a Kaslo curling story to tell, or picture to share? Don’t be shy, come up on Saturday and let us know! There are only 2 spots left for the Funspiel, so get your team registration in if you want to curl on Saturday! Than k you to Columbia Basin Trust for supporting our Open House. Than k you to the Kaslo 125 committee for supporting both our Funspiel and Open House. This entry was posted in 2017-18 by Kaslo Curling. Bookmark the permalink.